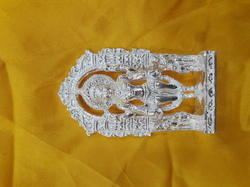 IT is 92 .5 % silver ghanpati with rath .There's minakari work done on it .Its a beautiful piece . We are dealing in Silver Balaji Idol. 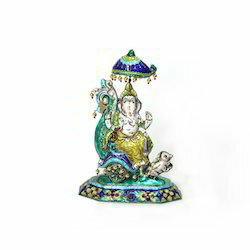 Our esteemed customers can avail from us a superior range of Silver Ganpati Idol. Manufactured from the premium quality base metal, the products are widely popular for their smooth finish and rich luster. We are a brand highly recommended for maintained quality standards in all our offerings. This Hanuman Idol is made in accordance to the traditional mahabali murti and is made of fiber. Capitalzing the skills of our professionals, we are presneting Silver Ganesha Statue the Silver Ganesha Statue is made by using quality silver and thus have fine sheen. Moreover, offered products are suitable for various applications.